OMI 220 bargraph indicator, Dual 101 segment LEDs in a 9/64 DIN case. 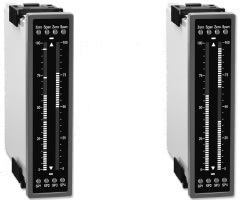 Smart dual bar, dual input or single input bargraph with up to four fully programmable set points and an isolated independently scalable 16-bit analogue input. Two 10 Amp Form C and two 5 Amp Form A relays available. Auto-sensing AC/DC power supply. For voltages between 85-265V AC / 95-370V DC (PS1) or 15-48V AC / 10-72V DC (PS2). Optional isolated 16 bit analogue output. 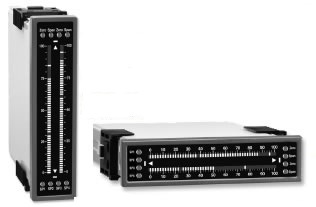 User or factory scalable to 4-20mA, 0-20mA or 0-10V across any desired span from ± one bar to the full scale range. 24V DC excitation is available to power external 4/20mA transmitters and 5 or 10V DC excitation is available for resistance bridge type sensors. Provision to connect an external programming lockout switch.